How silently, how silently the wondrous gift is given! I love to simply imagine what the first Christmas looked like. The pictures I conjure up in my head are probably as wrong as such imaginings usually are. 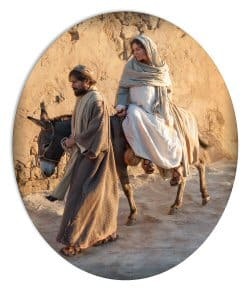 Still, I can’t help but think that though Bethlehem by day was a crowded and noisy place during that time of registration and census, as the night drew on it became quiet–a place where the Son of God could be born humbly and peacefully. Sarah’s version is in A major, Allyse’s is in G. You can transpose the score using the Personal Composer Demo. The harmonies you hear in verse three are optional, and are included in small notes on the score. Can’t get anything on the page of the download. It appears to have downloaded but when clicked on there is a blank page. Any advice? I’ve been downloading tons of other song all afternoon on this site. They drop down once I hit the download button, but this one doesn’t drop down so it downloads and once I go into downloads it comes up blank. Any advice? What an amazing site, and beautiful music! Thank you, thank you, thank you! I love the words with the emphasis on “quiet.” How lovely. Love your music. Thanks for sharing. Thank you Sally, I love this song. Will you consider doing a SSA version of this song, while keeping the violin obbligato? I would like the school choir to sing it! I just played your new song, A Holy Child is Born, and I loved it. I cannot sing well, but my family can and I look forward to hearing them sing it this year. So, it was not to late for us!